Earn $3.91 in Rewards credit. Click to learn more. Take it off the beaten path. Go where you wanna go with these versatile, durable plus-sized 700c tires from Schwalbe. The Smart Sam Plus measures 40mm wide, exceling in all terrains and all weather conditions for gravel grinders and adventure cyclists alike. Featuring Schwalbe's Addix rubber compound, the Smart Sam Plus is incredibly versatile, providing the perfect balance between rolling resistance, grip, and protection. Taking puncture protection to the extreme, the Smart Sam Plus features the DoubleDown belt with Greenguard technology, this added layer stands up to slashes and punctures. 700x40c tire that provides versatile performance for off-road adventures. Addix rubber compound is versatile, durable, and fast. 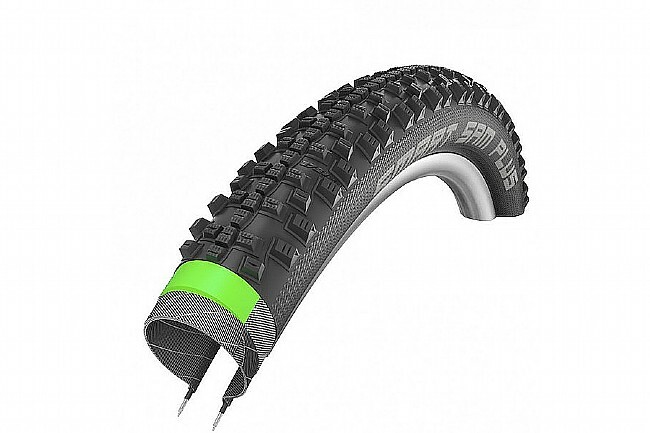 DoubleDown protection belt under the tread and through sidewalls deflects punctures or stabs. E-bike ready to 25 km/h. Articles will open in new tab. A short primer on emergency bicycle tire repair. Selecting the proper tires for vintage bicycles. A how-to guide to removing and installing tires, plus some useful tire tips. Find your tire size in this exhaustive chart. Know your tire size. This article provides a summary of the common, and not so common, bicycle tire sizes. Keep on rolling safely with these tire tips and recommendations. Tubular, clincher, tubeless? Wire bead or Kevlar bead? Application? Find answers here. The tube run-down: valves, weights, valve stems, sizing, and more.